Curating came as a natural consequence of Mieke’s wish to develop more lively, engaging ways of presenting her research. Once involved in filmmaking, initially for similar reasons, the step to curate an exhibition every now and then seemed logical. This began with the request, from the Museum Boijmans van Beuningen, to present a newly acquired painting to the public. The presentation became a small, but significant exhibition, titled Moordwijven! (Lady Killers!). This exciting experience led Mieke more into visual thinking, to making arguments with paintings put on display in certain ways. The large video exhibition 2Move, co-curated with Miguel Á Hernández-Navarro, travelled to four countries. Mieke currently tutors the participants of the Curatorial Program of De Appel, and intends to develop more curatorial projects in the future. Mieke has ben working in 2016-17 on Emma & Edvard. 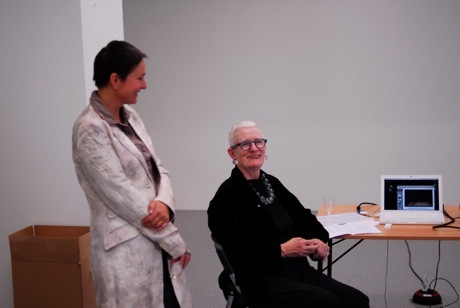 If you would like to find out more about working with her in a curating capacity, please contact Mieke.